With a nudge from the Holy Spirit, Matthew West’s non-profit ministry, popwe, informally shared the UNTOLD video and story with youth ministers, ministry directors, and life-affirming organizations. The feedback was unbelievable. Motivated by the powerful lyrics and music, they went a step further and engaged others in courageous conversations about life, choices, compassion, and forgiveness. They asked for help in creating resources to equip them to facilitate not just one great conversation, but ongoing dialogue, awareness, and action. In short, the nudge caught momentum…now it’s time to turn momentum into a movement. 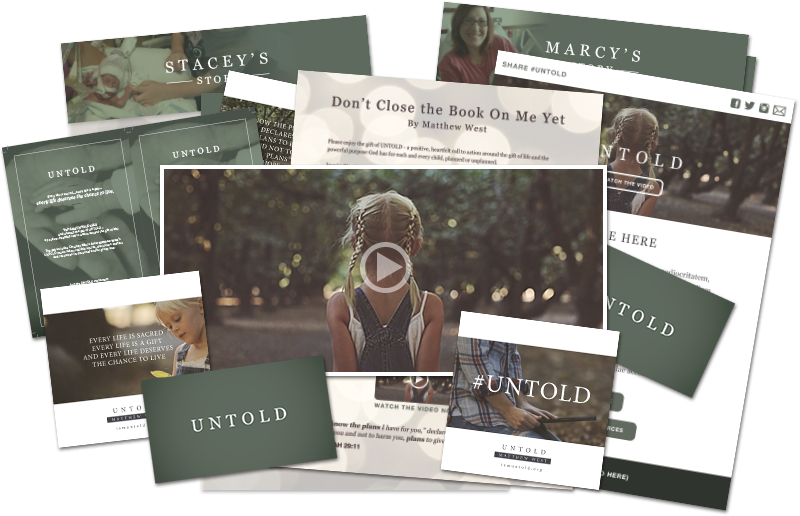 We created completely free, turnkey resources for you to easily share UNTOLD with your organization, members, and all to whom you minister! In addition to the four action items below, please feel free to download and use any portion of this toolkit. Please don’t hesitate to contact us with any questions you may have – we’d love to hear from you! Get in touch with key influencers or organizations in your area that might benefit from receiving this gift. Consider sending the site or video to your donor base as a reminder of the great work you do and ask for their continued support. A fully designed e-mail template is included for your convenience. Put the link to IAMUNTOLD.ORG on your organization’s website either during a specific campaign you are hosting or as an ongoing reminder of why you do the incredible work you do. Play the video at one of your upcoming conferences or team meetings. Post one of the (8) share graphics every other week to your social media sites or your website as a reminder of this message of hope. Use the provided Twitter feeds or come up with your own and use #UNTOLD. Play and debrief the song using small group discussions. Fold this song and the targeted stories into one or more of your scheduled family, youth, or adult ministry sessions. Consider sending the site or video to your congregation with a prayerful call to action. Put the link to IAMUNTOLD.ORG on your church’s website and/or include in the bulletin with a short message or call to action (see sample announcement). Consider using any of the (8) share graphics either in your printed materials or on your social media sites. Encourage awareness and prayer – nothing changes until our hearts do.